In order to begin this adventure properly we must point out that Punta de Mita is the Mexican coastal village while Punta Mita is the luxury development. This juxtaposition offers the very best mix of tradition and exclusivity. This microdestination is the closest point on land to the Islas Marietas—as soon as you arrive, book a tour, dive into the water with your snorkeling gear and venture out to explore this National Park. The busiest beach for tourists is El Anclote, where you’ll find shops, art galleries and a line-up of beachside restaurants and bars. This also is where you’ll want to take a SUP or surfing class. As you drive around take in the different small luxury hotels; that same road will take you to virgin beaches with great surf breaks at Destiladeras, Burros, La Lancha and Veneros. Mornings can be spent at the White Tuna Beach Club. To enjoy a taste of Mexico, head to Tino’s and Rosa Mexicano. 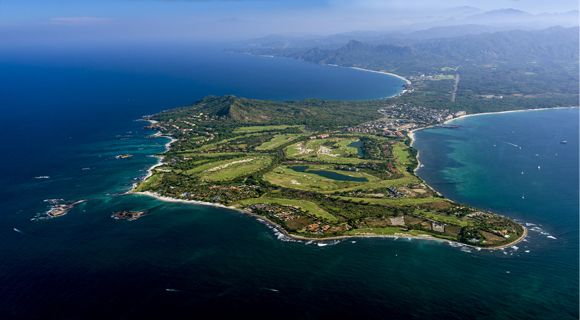 Positioned as the most exclusive development in Mexico, Punta Mita is home to the rest of the Destination’s selection of for Four- and Five-Diamond properties and restaurants. Its two golf courses are formidable, especially Hole 3-B known as “Tail of the Whale,” which is located on a natural island and can only be reached by amphibious golf cart. It’s the only one of its kind in the world! After a game, stop in at Sufi to savor an amazing culinary fusion meal. The town of Punta de Mita is home to Naef Cuisine’s amazing breakfasts and incredible ice creams—they’re truly out of this world and prepared from scratch. Seriously: they have flavors you won’t even believe are real!